Our friends over at PocketNow wrote an interesting article this morning that talks about Android brand recognition and the terms that are flying around out there like Droid and Galaxy. In their article, they talk about how the common consumer refers to these phones based on their individual brands, not the operating system they run on. Instead of people asking if you have an Android phone, they’ll ask if that’s the new Galaxy or Droid. If you have anything else, like the Google-branded Nexus phones, they’ve probably never heard of it and will brush it off even though it runs the same Android that their phone runs. One difference between these brands is the launcher that the phones use. The Nexus phones use the stock Android launcher, while Samsung uses their TouchWiz interface. This make the user experience a little different, but in the end, all of their apps come from the Google Play Store and they all can run the same things. The same theory can be applied to the newer Windows Phones. Microsoft pushes the operating system, but they have different manufacturers making the phones and doing their own marketing. Nokia is the biggest one when it comes to brand identity. They’re pushing their Lumia phones, and nowhere in the name does it say Windows Phone. None of the other manufacturers are taking that approach when it comes to Windows Phone. There’s the Samsung Focus and Focus 2, there’s the HTC 8X, and the LG phones. With the tablet market, Microsoft is pushing their own Surface brand, which is helping push Windows 8 and Windows on a tablet. There’s been rumors of them making a Surface Phone, and I think that would only help Windows Phone gain market share. Some people would say it might make the OEMs more resistant to develop phones for the platform, but I actually think it would help. Apple is really the only smartphone manufacturer that doesn’t have this issue. Their only phone is the iPhone, which they manufacture under their own brand. Before a couple years ago, everyone would ask, “is that the new iPhone?” and nobody really knew what Android was. Apple still has some of the best recognized brands out there, and part of that is because everything is released under their name. They don’t have OEMs like Samsung, HTC, Motorola, or Nokia making devices for them. Blackberry is another one similar to Apple. They produce their own hardware and release it under their own brand. They’ve had a few different branches in the past, like the Curve, Bold, and Storm, and even now they have the Z-series and Q-series. Only time will tell if they can become a major player again after the long delay for Blackberry 10 devices to come out. 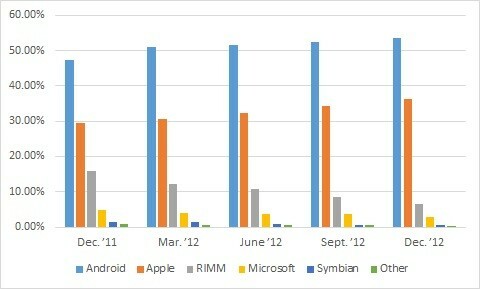 Looking at the graph above, you can see that Android dominates the smartphone market, mainly thanks to the Samsung Galaxy phones. Apple is 2nd and Windows Phone and Blackberry are fighting over 3rd. If Samsung was to slap the Galaxy name on a Windows Phone, how successful do you think it would be? For past and present Galaxy users, it would be a major change because Windows Phone is nothing like Android. It might bring more people to Windows Phone, but from there, it would all come down to how willing people are to adopt change and be different. Verizon did something similar to its Droid brand a while back. They were using their Droid term for all Android phones, regardless of the manufacturer. Most were made by Motorola and some were made by HTC.